"One of my all time favorites! My mother got this recipe from her friend Betty, It's a make ahead recipe, to be frozen and used later. My mother used to make mass quantities and take them out whenever she needed for an easy meal or hors d'oeuvre. She also made it with the light cream instead of milk." In medium bowl, toss 4 teaspoons flour with the grated cheese. Sprinkle mixture into the pie shell. On top of cheese, sprinkle 1/2 cup of diced ham. In medium bowl, combine eggs, milk or cream, and then add salt and mustard powder. Beat until smooth and pour over cheese and ham. Put piece of plastic wrap large enough to overlap sides over top of quiche, then a piece of foil, and seal well around the edges. (plastic keeps the foil from sticking to the food). Place prepared quiche in freezer. When ready to prepare, preheat oven to 400 degrees F (200 degrees C.) Remove foil and plastic wrap. Put foil around edge of crust to protect it. This dense, flavorful quiche doesn't need a crust to be a brunch star. i love that you can freeze this recipe but mine keeps turning out watery. VERY quick and easy! It only took 10 minutes to put together. I also added some frozen spinach. I love this recipe. Thanks for sharing!! 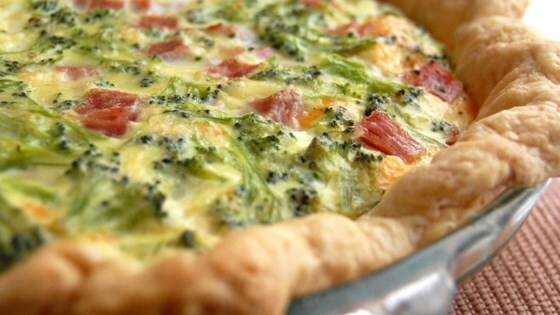 Good, easy basic quiche recipe. I added cheddar, scallions and mushrooms to it and it was fantastic.